“It’s not hot enough unless I’m dripping sweat as I eat it,” a friend of mine would tell the server at our favorite Mexican restaurant in college, as he ordered the secret, off-menu hot sauces for his burrito. Both in awe and disgust, I’d watch him pour threatening levels of neon orange and green sauces on his food, as I relished the buzzy head rush from the standard medium-level red salsa. As someone whose spicy food tolerance maxes out at sriracha -- admittedly a tame fire compared to the ghost pepper sauces my friend savors -- I wondered what’s responsible for our vastly different tastes. 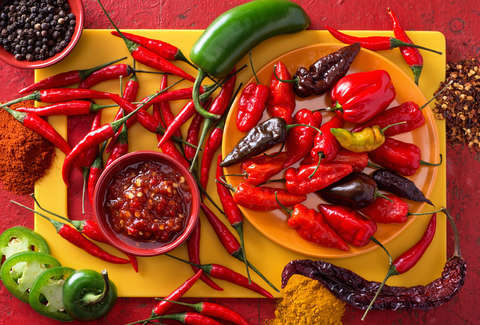 Basically, why do certain people flat-out obsess over spicy food? And what about, at the opposite end of the spectrum, people who can’t handle any heat at all? Eating peppers feels physically painful for people who shun spicy food. But Chef Bill Phillips, a spicy foods expert and associate professor at the Culinary Institute of America, says the suffering is all in their heads. “Although you feel like it’s burning [when you eat spicy foods], it’s actually a trick of the mind,” he says, adding that spicy foods do not cause any physical harm to a well-functioning digestive system. Are people born with a spice-hating gene? Chef Phillips says spicy food lovers aren’t born with an affinity for hot sauce. Rather, it’s acquired over time, as capsaicin and other spicy food molecules deplete a neurotransmitter called substance P, which is responsible for sending pain signals to the brain. 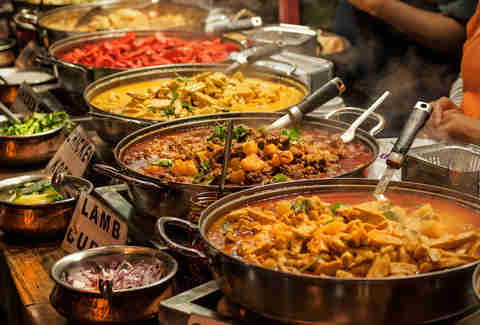 Affection for peppery food often points to particular personality qualities. Building on studies from the '80s that demonstrated a connection between enjoyment of roller coasters and passion for spice, researchers discovered that people with sensation-seeking personalities (i.e. thrill seekers) were more likely to enjoy spicy foods. People who love jumping out of planes, pursuing adventurous travel, and trying extreme sports are more likely to amp up the Scoville count (measurement of pepper pungency) of their meals than people who prefer less risky activities. The Internet is full of spice evangelists who can’t get enough heat, and they’re part of a shift in tastes in this country. "As a nation, we are trending toward more spicy foods. You can see it in Doritos. They keep amping up the spice level with capsaicin," says chef Phillips. "People are also breeding chilies and creating hotter and hotter hot sauces with capsaicin extract." So where does that leave the less vocal group, who really can’t tolerate more than a bell pepper and a crack of peppercorn? Chef Phillips encourages them to build up a tolerance by starting out "low and slow." He suggests trying small amounts of milder chilies, such as banana peppers or poblanos. Once those flavors start to burn less, up the quantity and start moving to hotter options, like jalapeño, serrano, or tabasco. Regular exposure will increase your tolerance slowly, over time. You may never become spice-head who craves Trinidad moruga scorpion peppers, but you’ll be able to survive a bowl of curry without chugging tons of water. Joni Sweet is a writer who likes it hot... but not too hot. Follow her on Twitter and Instagram at @JoniSweet.